The majority of our services are aimed at high-end customers who seek ultimate legal protection, peace of mind and rapid business expansion. The professional legal support of course only sets the foundation for the clients’ successful business growth and the multiplication of their profits. We help our clients not only to increase their exposure on the market place, but to also leverage their potential and to dramatically increase their profits. We are at the same time assisting to virtually eliminate all legal risks associated with our clients' the day-to-day business operations. The vast majority of the legal and consultancy companies in the world are focusing on providing information that should help improve their clients’ business results. We are not only focusing on providing information however. We believe that our greatest value is in that we are helping our clients to achieve sustainable transformation of their business model. At the same time, we are ensuring their ultimate legal compliance in order to eliminate all risks. In fact, through the transformation of our clients’ business models, we are aiming at complete life changing results – multiplication and preservation of the clients’ wealth, combined with flawless legal support. Ultimate legal compliance is the key to risk management and sustainable results in any international business venture. Business ideas however, unique branding, successful marketing and high-ticket sales, are the keys to rapid expansion and profit multiplication. We aim at providing the full package – the unique combination of legal security (both personal and corporate, as they are usually intertwined) and business opportunities to provide profit. Neither legal compliance nor peace of mind can be sustained without strong results and profit. And no profit can be upheld without ultimate legal compliance. We believe, we can do the job to legally backup your business and at the same time, to dramatically increase your results. While the information on our homepage is intended to provide a general idea about the area of our expertise, we urge you to carefully read the specialized subpages below (will open in new window). You will find valuable in-depth information about the Bulgarian Program for Citizenship by Investment, the Family Office & Asset Protection, the Accountancy and GDPR Compliance and the Criminal Law defense, that we provide. How much does it cost to obtain new citizenship? Our lecturer Mr Dobrinov is speaking on the topics of "Residence permits in Bulgaria" & the "Citizenship by investment program"
Legal EU immigration services, long term EU residency permits, work permits & EU retirement. 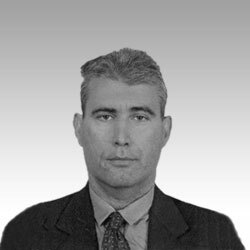 Long term Bulgarian visa type "D". Legalization and certification of supporting documents. Bulgarian company formation services. Company administration and accountancy services. 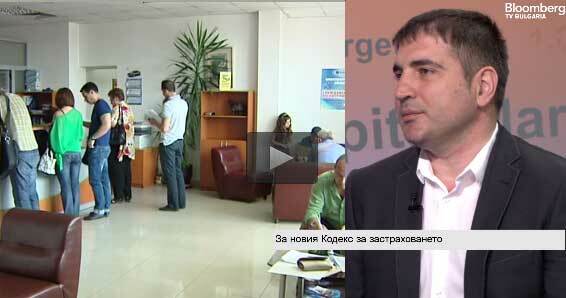 Bank account opening in Bulgaria and tax compliance. Global Citizenship. Citizenship by investment (fast-track) of Cyprus, Malta and Bulgaria. Bulgarian citizenship. How to obtain EU citizenship and Bulgarian passport through investments. Wide range of citizenship by investment services for high-net-worth individuals. 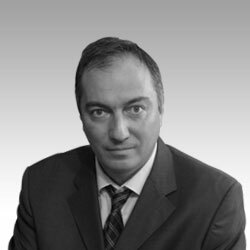 Civil and criminal law by highly experienced lawyer in Bulgaria. Representation in Court and legal advice. Extremely useful information from Bulgarian lawyers on different legal matters and cases. We provide personalized legal services to both medium-sized companies as well as major international corporations in virtually all business areas, such as M&A, restructuring, business formations, due diligence, privatization, concessions, labour law, bankruptcy and liquidation. Merging of different enterprises into a single formation, as a result of acquisition or merger of assets or other transferable rights, is one of the most important means for corporations to expand their business and enhance their financial performance. With the rapid globalization and the influx of new telecommunication technologies, businesses from around the globe began working closer, which has led into a sharp increase of the M&A and restructuring deals in the recent years. On a local level, since Bulgaria joined the EU in 2007, this sort of transactions have become the backbone of many foreign investment strategies and market penetration techniques. The opportunities look endless, but so are the legal challenges. Merging assets internationally or acquiring new ones requires not only solid business strategy and a lot of spirit, but also a good knowledge of the legislation in the target country. Mergers and acquisitions demand in depth understanding of the business environments of all parties involved and are also, often, subject to regulatory approvals. Our team can act on behalf of the customer in order to facilitate these processes. Our specialists are experienced in different business areas and can help the client with profound knowledge and skills in virtually all economic sectors. Unlike merging, acquisition or restructuring of existing entities, setting up a brand new business presents another unique challenge. Often, the would be investor is faced with the worrying perspective of diving into another country’s business and legal rules without a solid backup from professional advisors. Setting up a new company in Bulgaria may be a straightforward procedure, but if handled by non professionals, can lead to many potential hurdles at a later stage. With the lowest EU corporate tax in Bulgaria of only 10%, alongside many other administrative and legal benefits, starting business in Bulgaria by foreign companies and individuals has skyrocketed in recent years. As expected, the problems arising from unskilled legal work at the starting phase of the incorporation, began to emerge, and are now flowing into the court rooms. This is a scenario someone would like to avoid at all costs. Our legal advisors will be able to assist you in case you are already having similar difficulties. If you are considering entering the Bulgarian market by registering a new legal entity, we will advise you on the most appropriate structure for your particular needs. Once a decision is taken, we will register your Bulgarian Limited Liability Company (LLC or LTD), Joint-Stock Company or any other form of business model. We will assist you to obtain all required licenses and permits in order to start your operations without any delays or legal obstacles. We will also register all forms of non-profit NGO’s, such as foundations, clubs, charrities, etc. When a business deal is to be concluded, which involves legal transfer of certain assets, the parties (most often the buyer) often require professional report on the current state of their counterpart’s business – a due diligence . This report is not a mere financial or legal report, showing the entity’s current state of affairs – it is a way to identify what is hidden under the surface. The report will identify and assess certain risks, which will enable the purchasing party to negotiate and demand from the seller a set of warranties. These warranties will typically relate to certain actions that will need to be taken by the seller in order to remove some irregularities related to the assets being transferred, which irregularities would otherwise present a serious obstacle for the buyer. The due diligence report is often a legal prerequisite for the buyer in order to have the deal approved by its supervisory body or by its investors. Even when there is no legal requirement for a due diligence, having the report prepared is often the most important factor for the party to take a well informed decision. Depending on the structure and the size of the contractual transaction, as well as the type of assets being transferred (e.g. company shares, financial instruments, real estate, etc. ), the due diligence report can be either limited to the specific asset, or cover all aspects of the contracting entity as a whole. Our approach to each and every due diligence project is flexibly adjusted to our customer’s requirements. We do our utmost to be not only fully objective, but to also interpret and explain the Bulgarian local laws and customs to our customer, in order to guarantee unbiased review of all issues. Based on our experience, we believe that we are in position to perform all necessary researches and prepare even the most sophisticated and comprehensive due diligence reports in Bulgaria. Our knowledge of the local legislation, combined with the in depth experience of our professionals in different fields of the Bulgarian business, provide us the unique chance to be ahead of most of our competitors in Bulgaria. The privatization of state property is considered the core of the market economy as well as a mean of financing for the government. In Bulgaria, the privatization process began in the early 90’s. During the years, the privatization processes have evolved and are now encompassing a few different techniques. Our specialists have legally advised many customers and provided legal solutions for a hassle free privatization process. The privatization of state property doesn’t end where it starts – at the legal transfer of the property. The whole post-privatization process is carefully monitored by the Privatization and Post-Privatization Control Agency (PPCA) and it is of essential importance for the deal to be finalized ultimately with the expiry of the transition privatization period. The processes are accompanied by joint tenders for state and municipal companies, which again, require serious legal backup by professional teams. Concessions, in a way similar to privatization, provide another unique opportunities to both Bulgarian and international investors to gain access to many of the Bulgarian resources. Immediately after the political transition took place in Bulgaria in 1989, many foreign investors realized the enormous potential of the country’s natural resources – precious metals, mineral water, recreation resorts, etc. The legal framework of concessions is one of the most complicated and sophisticated as it has to comply with the national legislation and at the same time be consistent with EU laws. Therefore the legislation is often being revised, which leads to confusion among potential foreign investors. Our specialists are constantly being called upon to support customers who are cautious about their concession contracts and rights and are therefore counting on professional legal support. Bulgaria’s accession to the European Union in 2007 provided new opportunities for both Bulgarian companies to hire EU citizens as well as European Union companies to employ Bulgarian nationals. The labour legislations however often generated uncertainty among businesses of all sizes. Businesses in Bulgaria were at times struggling to comply with all different norms, which originate from both the national laws as well as the European directives. The legal issues which arose are often of great complexity and require professional approach and analysis. It is also worth mentioning, that the reduced volume of work in some Bulgarian companies, mainly due to bad organization and structuring skills, have led to a real legal challenge for those companies in their effort to reorganize their employee structure. Either by layoffs or by serious restructuring procedures, these companies had and have to comply with many different regulations and legal requirements. In this connection, our team has focused on identifying these issues in order to provide sustainable solutions that are both protecting all parties’ interests as well as are fully compliant with the current labour laws. We spend great deal of our time and effort working on the new opportunities provided by the amendments of the Labour Code of 2011 concerning work from home, distance work and temporary employment. These amendments came to provide unique opportunities to Bulgarian and EU workers in order for them to seek and find jobs in different jurisdictions, avoiding great deal of the usual time and residential constraints. As all good things in life, businesses, no matter how profitable initially, sometimes end their existence. Whether the decision is taken voluntary or not, the legal consequences are enormous – for both the ceasing company and its creditors/debtors. The economic situation in Bulgaria and the world as a whole has direct impact on the financial state of the businesses in Bulgaria. The relatively liberal credit environment in Bulgaria led to a growing business to business indebtedness. This in turn transformed into an increased number of liquidation and bankruptcy processes. Our team has steadily expanded its services to our customers in the last years. We provide legal support to both companies who want to have their liquidation process legally backed as well as those who seek debt recovery. Legal processes of this kind are complicated and require specific knowledge. Our team members have proven themselves to be of great assistance in such legal cases. We advise companies and high net worth individuals on the different aspects of the Bulgarian tax and social security legislation – corporate and personal taxation, VAT, health and social security contributions, as well as the applying of EU tax directives. 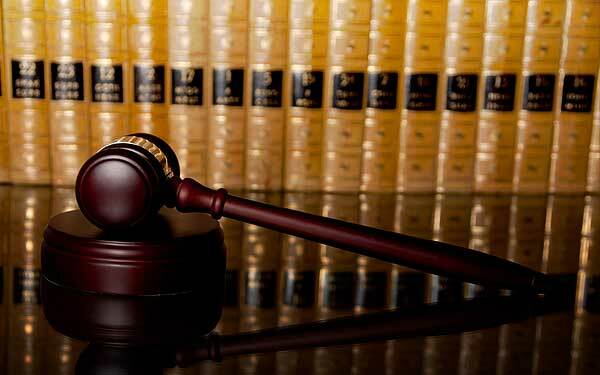 We also assist with appealing against tax judgments. Corporate tax law is a complicated legal subject, especially when it comes to companies engaged in international business. In the recent years, a clear trend of intensifying tax control over businesses has been observed. Tax authorities are not only exchanging enormous amount of information between different jurisdictions with a click of the button, but are also hiring highly skilled staff to check and penalize even the slightest non conformity with the legal regulations. In this respect, it is of utmost importance for companies across the globe to bring their books in order and keep sustainable high standards as far as their tax matters is concerned. Bulgaria doesn’t make an exception from this international trend. As a result, the amount of non-approved transactions for tax credit by the authorities, such as requests for VAT (Value Added Tax) refund, has risen dramatically. This has led to a sharp increase in the number of administrative and court disputes in order to establish the exact amount of tax liabilities. The VAT legal framework is extremely dynamic and complicated. The harmonization processes within the European Union combined with the different approaches by each individual member state are transforming the VAT regulations into a constant legal battlefield between companies and authorities. Many of these disputes end only with the intervention of the European Court of Justice and in some cases, even when the European Court of Human Rights has been appealed. In order to be able to comprehensively assist corporate customers with their tax issues, we have hired highly qualified advisors with profound knowledge and extensive expertise in tax matters. 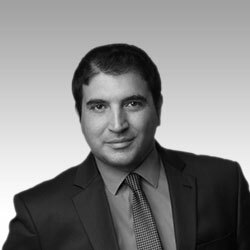 From simple filling of annual tax declarations and statistical forms to highly sophisticated tax disputes, either in court or administratively, our team is prepared to meet even the highest expectations. We are of course assisting on a regular basis companies by providing them with tax advice for maximum compliance and legal tax optimization. With the enforcement of the General Data Protection Regulation (GDPR) in 2018, compliance conscious companies realized the need of professional assistance in order to eliminate all risks that arise from the GDPR implementation. Customer data protection is now vital asset and failure to protect it may result in huge fines. For more information on company accountancy and administration, GDPR compliance and legal support to companies, please refer to our Accountancy & GDPR Compliance section. Personal taxation is the final part for the individual into his dealings with the tax authorities. Whether the person receives a salary, dividends, commissions, interest on bank deposits, profit from sale of securities or real estate, just to name a few, a tax is usually due to the state. The unleashed business opportunities in Bulgaria after the change of political system in the early 90’s, combined with the extremely favorable flat tax rate of only 10% (both personal and corporate) resulted into many expatriates relocating to Bulgaria. With the accession to the EU in 2007, Bulgaria harmonized its tax legislation and applied gradually the EU tax directives covering exchange of tax information between the EU tax authorities. At the same time, similar to most EU tax bodies, the Bulgarian National Revenue Agency (NAP) tightened its grip on the tax collection processes. By means of many legislative amendments, approved by the parliament, the scope of tax liabilities in Bulgaria was greatly enhanced and tax avoidance was criminalized. In 2015 the Bulgarian parliament went even further and approved additional measures by making the non payment of social contributions a punishable offense. Logically, during the last few years, court hearings about determining the amounts due for personal taxes, have skyrocketed. 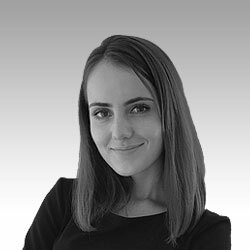 Our team has great experience in the field of personal tax and social security laws and is helping customers in Bulgaria to cope with the dynamically changing legal circumstances. With the tax laws changing multiple times during the year(s), it appears sometimes, that without professional legal assistance, it is virtually impossible to comply 100% and stay on the safe side. Especially when it comes to high net worth individual taxpayers, it is absolutely essential to calculate the tax due and submit the relevant returns with professional legal assistance only. 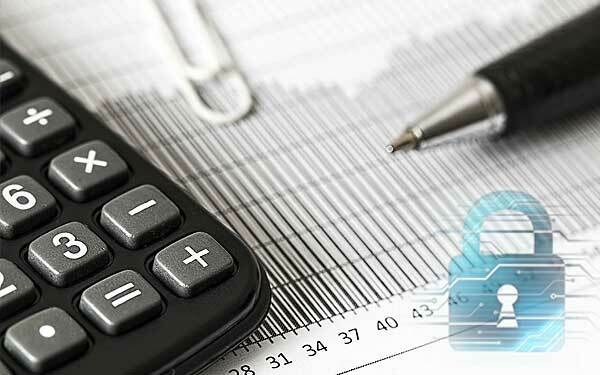 Legal tax optimization is another aspect of the tax compliance. One needs to aim at great balance in order to keep its tax returns perfectly in order and 100% legally compliant and at the same time achieve optimal tax burden. When it comes to dealings with the tax authorities in Bulgaria, the general rule is, that the National Revenue Agency (NAP) has the first say - all tax acts (including penalties and compulsory recommendations), issued by the Bulgarian tax authorities, have to be either fulfilled or disputed. Although with the employment in recent years of highly qualified specialists by the National Revenue Agency, issuance of ungrounded tax acts has declined somewhat, it is unfortunate to conclude that many of the decisions by the tax offices are still not properly backed legally. Logically, the amount of tax disputes has increased significantly. Tax laws are indeed very subjective. Determining "simple" things like "place of main business" or "predominant business activities" can be a real legal challenge. It is not to blame on the tax authorities, that as far as their initial act is the one that is being enforced most of the time, they reasonably tend to decide in favor of the state budget. When tax paying companies and individuals believe that their rights have been violated, they have the option to appeal, either administratively or in court. And here is where the complexity of the legal system in Bulgaria doesn’t help a lot. To file and engage in a proper dispute, it is essential to have profound and in depth knowledge not only of the different tax laws, but also to be able to apply correctly the administrative codes (the legal codes that are regulating how disputes are being handled, what is the legal time period for reaction, just to name a few examples). A simple initial mistake by a non professional would completely devaluate all further efforts by the concerned party. Our team is fully qualified to appeal against tax judgments in Bulgaria, either administratively or in court. It is important to determine from the very beginning, together with the client, which option should be chosen as both have their advantages and disadvantages. In many cases, our experience in tax matters will be sufficient so we can safely advise the customer of the option of choice. We will also safeguard our client’s interests and will apply strictly the applicable legal codes in order to ensure that all deadlines and prerequisites are being met and the foundation for a positive legal outcome have been set. Bulgaria has signed a large number of double taxation avoidance agreements, which, if used correctly, can save the taxpayer the unnecessary hassle of paying taxes in more than one jurisdiction. Applying correctly these norms however, requires solid legal background and careful judgment in each individual case as to whether the regulations of the double taxation avoidance agreements can be safely utilized. We are legally advising foreign nationals living in Bulgaria about their options and possibilities as to the applying the norms of double taxation treaties and optimizing their tax liabilities. It is sometimes a very favorable option for high net worth individuals to have their tax residence in Bulgaria. The European Union Savings Directive (EUSD) and its enhancement and transition into the Common Reporting Standard (CRS) by the Organization for Economic Co-operation and Development (OECD), as well as the USA Foreign Account Tax Compliance Act (FATCA) are the legislative measures taken by the Governments to combat tax avoidance and increase budget revenues. These acts are undoubtedly providing a breath of fresh air for the economies, but are also a cause for concern among the international business community. Our specialists are regularly taking part in organized events where the above acts are being discussed and legally interpreted. We are able to provide professional legal advice for both institutions who have to comply with the reporting directives and seek assistance as well as to companies and individuals who are directly affected by the exchange of information. Penal law is the legal field that relates to crime. The Bulgarian penal code regulates the social conduct in the country, defines what constitutes an act of crime and the punishments applied. We are assisting at all stages individuals who have been either detained or are prosecuted in Bulgaria. For more information, please visit our specialized page - Criminal Law defense. Police detention in a foreign country is a real nightmare and an experience nobody wants to endure. Unfortunately, it happens all the time, everywhere, and Bulgaria is not an exception. Many things can go wrong and lead to police arrest and even prosecution; traffic accidents, non-declaring of funds at border checks, domestic incidents, just to name a few. These examples are probably the most "innocent" and most frequent events that force many foreign nationals to defend themselves in the Bulgarian courts after they are released (eventually) from police custody. If being detained, the person is often under enormous stress and his actions are not always logical or correct from a legal point of view. There are many cases when the developments during the first hours of the detention have played such an important role in the latter court hearings, that all further efforts by the defence have been completely undermined. Therefore it is of utmost importance that the detained person asks for immediate legal assistance and representation. It is also extremely important that the person is released from custody as soon as possible, which can be ensured best by means of professional legal representation. Early release from the police quarter will guarantee the defendant better possibilities to build an optimal defence strategy and will relief him from the stress of being under custody in abnormal conditions. Our solicitors are well prepared to react swiftly in similar extreme situations. Irrespectively of the time of the day and the location of the police department where the person is detained, we will provide a professional criminal solicitor who will act in emergency and will ensure that the best legal solution is applied. Our solicitor will fully support the client and will ensure that he is released from custody as soon as possible. We believe this emergency service is absolutely essential for everybody in similar, unfortunate situation and we are confident that our services can be invaluable. In recent years the penal lawsuits in Bulgaria have multiplied. This phenomenon is caused mainly by the serious determination of the authorities to fight corruption and organized crime, but even more importantly by the legislative amendments to the Bulgarian penal code, which expanded dramatically the scope of incriminated offences. Previously, perfectly legal actions, such as dealings between affiliates with the purpose of optimizing taxes, constitute now punishable crime. Similarly, administrative violations, such as non payment of social security contributions, were recently criminalized as well and are now being punished by serious jail terms. Opposed to that, amendments that decriminalize certain actions, such as the recent narrowing of the scope of currency offenses, are passing the Parliament very rare. In line with that, the amount of enquiries that we are now receiving to defend private individuals in criminal cases, have increased steadily during the recent years. Professional legal representation in criminal lawsuits is probably the most important and essential kind of assistance, as the most important human value for the defendant – its freedom, is at stake. The defendant is facing the whole might and power of the state legal machine and it is only up to him and his legal representative to defend his innocence (not to be confused with the "presumption of innocence" or "Ei incumbit probatio qui dicit, non qui negat"). We believe we are in position to provide the best legal defence against criminal incriminations in Bulgaria. We are closely monitoring the legal developments and the laws that are being passed by the Parliament and are constantly keeping up to date with the particularities of the Bulgarian legal system. Sometimes things may have gone the wrong way from the very beginning and the client has been already found guilty in a lower court trial. If this is the case, there is no need to panic. Though a court sentence may sound really discouraging, in many cases the final outcome of the trial can be either completely revised on higher court instance or at least the sentence can be seriously softened. We believe the law should be fair and we defend our customer to the maximum extend of law. Fortunately, there are enough options to appeal court judgments in Bulgaria. We never advice changing legal representative between court hearings or before appealing at higher court and strongly believe such an action should be taken only as a last resort. There are cases however when such act is vital for the successful outcome of the legal case. When the stakes for the defendant are so high and at risk, all options should be considered in some cases. Our specialists are able to assist clients who have found themselves in similar unfortunate situation. Sometimes, there is no need to change their current legal representative, but appoint us to support our colleagues and in many cases, simply better understand the client’s position and find a more suitable defense strategy for the appeal, which can stand in court. We provide wide range of consultancy and legal services to potential investors in Bulgaria, in order to enable them to take informed decision and safeguard themselves against any legal complications. Our services are always adapted to the specific circumstances of the client. After the political changes in the early 90’s and the transformation of the Bulgarian economy into a market economy, many business opportunities have emerged. As a result, foreign investors from all over the world have invested in different economic sectors in the country. Ranging from private investors who were buying houses in the countryside and holiday homes at the seaside, to multinational corporations who have invested in the largest Bulgarian enterprises, all investors were faced initially with the legal challenges in Bulgaria. 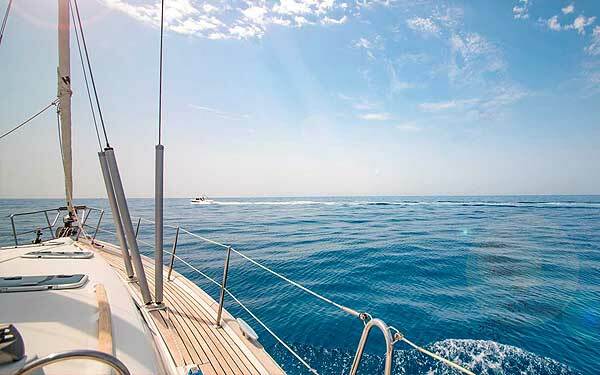 Our advisors and solicitors have provided their expertise in order to legally safeguard the investor’s interests and to avoid any potential pitfalls after the purchase of the assets in Bulgaria. We provide services mainly in two different circumstances. Often, the investor has already identified the asset he wants to purchase and needs solid legal backup in order to complete the transaction. Our services in this case start with the due diligence report and go through the preparation of the sales contract, taking into account all circumstances, tax consequences and other legal issues. Our support doesn’t end at that point - we continue to support the client in the event of any issues that may arise after the deal has been completed in order to fully protect the investor’s interests. The other instance when our intervention is required is when the investor wants us to search and identify for him a suitable asset in specified sector. In this case, we provide a number of actions in order to spot the best business opportunity. Naturally, we follow up the deal to its whole length and ensure safe and legal transfer of the assets to the client. Investment in real estate developments is largely done through participation in large-scale projects and in many cases it begins from the very first phase – the design and planning. This stage is often loaded with enormous amount of administrative and legal hurdles. The complexity of the procedures that need to be followed is often a strong detergent to the foreign investor. With our assistance however, these processes can be easily streamlined and all necessary formalities can be met and the relevant permissions and approvals obtained. The construction process then continues with the project management of the building activities, which is another test for the investor, as he has to deal with all subcontractors - civil engineers, architects and supervisors. This poses additional legal challenges. Our experienced specialists in the field are able to provide invaluable legal support by drafting all building and other contracts and documents as well as preparing the necessary formalities for the issuance of the final notary deeds for the property. We have successfully intervened in different projects and have transferred the foreign investor’s desires and practices into his Bulgarian project, thereby accomplishing the highest standards and legal conformity. The due diligence we prepare is another essential part of each similar project and includes all necessary checks about encumbrances and the existence of legal permits and permissions. The client can benefit from our legal experience and can better concentrate on his core business activities, thereby saving time and money. Real estate transactions are, from a legal point of few, a transfer of property rights. These transactions entail substantial costs and may lead to different tax consequences for both the buyer and the seller. Some of the costs involved are statutory and predictable (can be calculated precisely prior to the deal being signed). The precise structuring of the real estate transfer is essential in order to prevent any additional unforeseen costs, as well as to minimize any negative tax consequences for the parties involved. This is always a big challenge to any foreign investor, who is unaware of the different domestic laws in Bulgaria. Normally, the choice of how to finalize the deal is either by purchasing of the property directly or by taking over the shares of the commercial entity that owns the real estate. As a general rule, the transfer is done in front of Bulgarian notary public. In the course of our work, we have identified alternative arrangements for real estate purchases, which we can offer to the client and adapt to his personal financial and tax circumstances. In some cases, similar arrangements may provide a substantial benefit to the customer. Depending on the type of property and the needs of the client, we are able to recommend the most suitable structure of the real estate deal, thereby explaining all associated risks and benefits. Finding the best balance between those is the most essential part of the real estate transaction planning. We provide immigration consultancy and legal advice services to high net worth individuals or people who otherwise qualify for inclusion in specific enhanced immigration schemes, regulated by the "Law for the Foreigners in the Republic of Bulgaria" and the "Law for the Bulgarian Citizenship". Immigration to Bulgaria has its great benefits – pleasant mild climate, beautiful seashores and picturesque mountains, four distinctive seasons with endless possibilities for both sunbathing and winter sports, rich cultural traditions, jus to name a few. All that combined with low corporate and personal tax (the lowest in EU), political and financial stability under EU regulations, make Bulgaria one of the most desired destinations for relocation of private individuals from around the world. While for people from the EU there are practically no administrative hurdles to move to Bulgaria permanently, for those outside of the European Union, a set of legal procedures have to be followed in order to comply with the regulations and to receive residence status. Our team has extensive experience in immigration law and is providing full administrative and legal support services to clients who wish to relocate legally to Bulgaria. Two of the most often used options (though not the only ones) are foreseen in the "Law for the Foreigners in the Republic of Bulgaria". The first option that qualifies the applicant to reside legally in Bulgaria is to perform business activities in the country, thereby employing at least 10 Bulgarian citizens. This option is very useful for entrepreneurs from outside of the EU who are planning on expanding their business into Bulgaria and at the same time would benefit from immigrating to the EU. The second option that qualifies the applicant for resident status is the purchase of real estate property (or properties) for an amount of at least 307,000 EUR. This option is mostly utilized by people who possess the necessary funds to purchase a property for themselves where they can move in immediately and relocate legally to Bulgaria. For those who would like to immediately benefit from permanent residency in Bulgaria, a status that provides much more possibilities and significantly enhanced set of legal options, there are other programs foreseen in the Bulgarian legislation. The one, which is most appropriate for private individuals with sufficient funds available for investment is specified in article 25 of the "Law for the Foreigners in the Republic of Bulgaria". The option provides the possibility for the applicant to receive permanent residence status in Bulgaria if an investment of 512,000 EUR is used for the purchase of shares (which are traded on the Bulgarian Stock Exchange), bonds, derivatives and other specific investments. The amendment of the law of 2013, added another unique opportunity, namely the investment of the said amount under management with Bulgarian licensed credit institution (ie bank) for a period of at least 5 years. Bearing in mind the stability of the Bulgarian credit institutions under the supervision of both the Bulgarian and the European financial regulators, we believe this option is definitely worth considering. Another option, used mainly by managers of large corporations is investing an amount of at least 3,068,000 EUR into a commercial company, which is not traded on the Bulgarian Stock Exchange. No matter the option chosen, our legal advisors will guide the customer through the whole process, guaranteeing full legal conformity and successful outcome of the immigration application. The ultimate step of the immigration process is the naturalization and the receipt of Bulgarian (EU) passport. Citizenship comes with a set of rights and obligations. 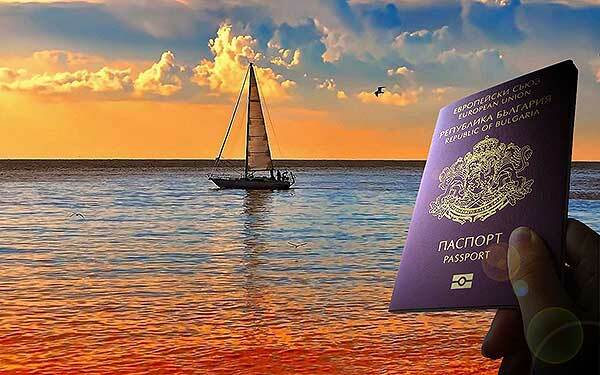 The visa-free (or visa on arrival) travel to 145 countries worldwide that comes with the Bulgarian passport is probably one of the most important values for many foreign individuals. On top of that, being an EU citizen provides the individual with many other benefits, such as access to consular aid from all EU embassies in certain circumstances and free right of settling and working in all EU countries. Unless you have Bulgarian parent(s) of course, the procedure to obtain Bulgarian citizenship is complicated, time and money consuming. As a general rule, a number of years of legal residency is required as well as taking comprehensive language exam before the person can apply for Bulgarian passport. Luckily, for those with adequate financial resources, Bulgaria offers the most lucrative naturalization program among all EU countries and probably the most rewarding investment citizenship option in the world. We have dedicated a special website for those who are interested to become EU citizens in time period of just more than one year. For more details, please visit how to become Bulgarian citizen via the fast track naturalization option. Our immigration lawyers are well prepared and are assisting private individuals in their goal of obtaining their new citizenship. Please liaise with us for a personal meeting so we can discuss all available options in your particular situation. Our Team and Our Presence in the Public Media. Our Mission, Vision and Values. The experienced team of VD&A is assisting our valued customers 365 days per year to solve even the most complicated cases. We often organize and participate in international seminars and events in destinations, such as Geneva, Moscow, Dubai, London, etc. in order to achieve maximum legal exposure worldwide. Upon request of our customers, our lawyers travel to the destination of the client to facilitate the legal process and provide invaluable assistance. Mr Vasilev about the procedure of deregistration of uninsured motor vehicles in Bulgaria - the legal framework is still unclear. Click on the image above to watch the full video interview (in Bulgarian). The procedure for deregistration of vehicles with expired "Motor Third Party Liability" (MTPL) has not yet been clarified. The relevant provision is controversial and debatable and is yet to be seen how it will be implemented. This is the opinion of the expert in the field of insurance law attorney Hristo Vasilev in "Business Start" on Bloomberg TV Bulgaria. 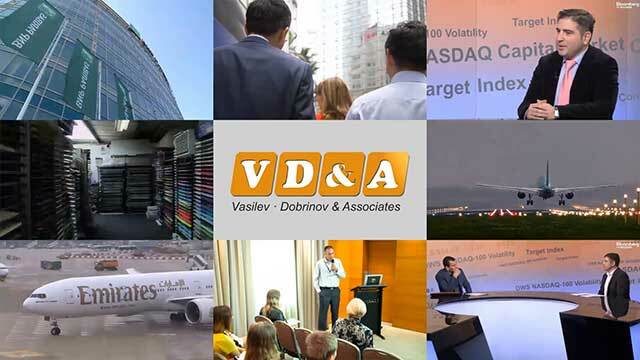 Despite some controversial moments in the new Insurance Code (IC), it is a "step in the right direction" to synchronize the Bulgarian and European insurance practices, Vasilev said. According to the lawyer, the discontent of so-called "seasonal drivers" has its reasons, but on the other hand, "there is no way to put them in a privileged position compared to the others". Another controversial text in the new IC is that the insured person must first send his claim to the insurer, and only then to the court. This greatly prolongs the procedure of resolving the issue. In regard to MTPL, previously the victims of road accidents had the right to lodge claims for compensation before the court first, and now they will have to send their claims to the insurer first, the lawyer said. "The insured must first notify the insurer to claim insurance compensation, to document his claim and only then he can go to court.". According to the guest, insurance benefits in some areas are still very low. "The benefits in personal injury and death are too low compared to European requirements and 90% are resolved in court. If the insurer proposes a third of actual damages in court can be obtained 100%. The court awards the highest benefits, but the proceedings are time-consuming". Our lawyer was a guest in the TV show "The Day from Close View" with Maria Andonova and they discussed issues related to labor and insurance rights of employees and employers. Anyone interested can see the conversation by clicking on the image above. Commenting on Interpretative Ruling No 1 dated 26.02.2014 in the evening issue of "News 7". On 31.01.2013 in the evening issue of "News 7" our lawyer Mr Vasilev commented on the legal aspects and consequences of Interpretative Ruling No 1 dated 26.02.2014 as per interpretative case No 1 dated 2013 of the Supreme Administrative Court. An interpretative ruling essentially examines the legality of establishing violations with mobile cameras on the roads. The Supreme Administrative Court ruled whether based on Art. 189, para. 4 of the Road Traffic Act a technical device establishing and capturing violation should be installed only in a stationary way or it can also be mobile. The ruling of the Supreme Administrative Court stated that the according to the hypothesis of Art. 189, para. 4 of the Road Traffic Act, identification and recording of an offense can be implemented only with a stationary technical device that had been previously marked and function automatically in the absence of a supervisory body. The TV Show "Court Dispute" on Nova TV - Episode 228 "My daughter is harassing me". Click on the image above to watch the full video coverage (in Bulgarian). Mr Vasilev appeared in the show at the position of a public defender of the daughter, as in the show we were examining a complex set of intertwined emotional, family and property relations and connections. Particularly dramatic and interesting for the viewers was the emotional relationship between the mother and daughter and their personal story. TV show "Civil Control" on News7. Click on the image above to watch the full video coverage (in Bulgarian). 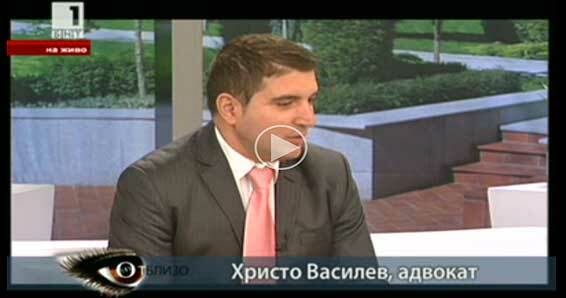 Our lawyer was invited in the TV show "Civil Control". The main topic of the discussion was "The small person against the system". We think it was a very successful and appropriate theme for the time and the system we live in, because each one of us has faced the system that feeds and tolerates many administrative disorders, bureaucracy obstacles and formalism of any kind, which cause suffering of ordinary people. In this case the participants were talking about the civil and labor rights of mothers - one of the most vulnerable groups in our society. 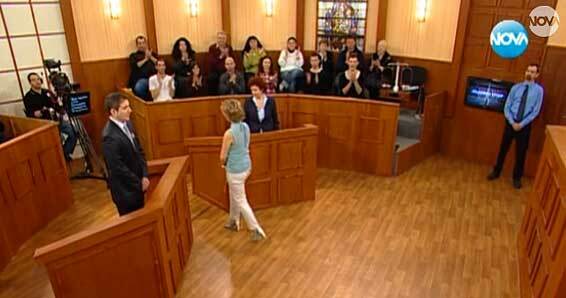 Our lawyer participated as a public defender of the defendant in episode 191 of the TV Show "Court Dispute", entitled "I was deceived by BGN 270,000". 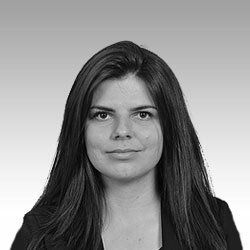 The claimant Galina Velidolska was misled in a fraud scheme by defendant Margarita Georgieva to conduct joint business - importing of toys from China. To fund the common business Galina Velidolska was asked by the defendant to mortgage her two residences in Varna in favor of the two companies, as Galina herself had been a manager of one of them. Two large bank credits had been acquired, as payment of installments was subsequently ceased by the companies and Galina had fallen into a deadlock situation and the threat of losing her properties. On this occasion she contacted the television and the TV show "Court Dispute" in order to gain publicity for her problems and in search of a way out of the current difficult situation. For the full video coverage, please click on the image above. 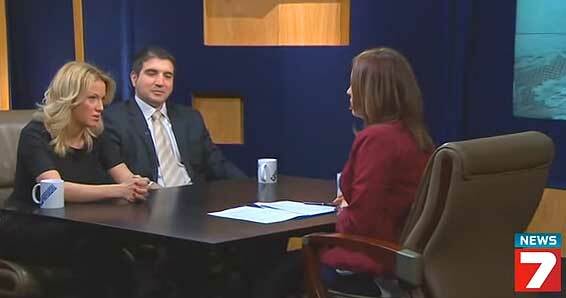 The legal-themed TV show "Directly on Legal Affairs" dated 01.07.2014, on "Skat" television. Our Lawyer Mr Hristo Vasilev was invited as a guest in the show, where he and the host lawyer Maria Koleva discussed insurance issues and whether the Bulgarian bank deposits are guaranteed, in relation to the status of Corporate Commercial Bank. 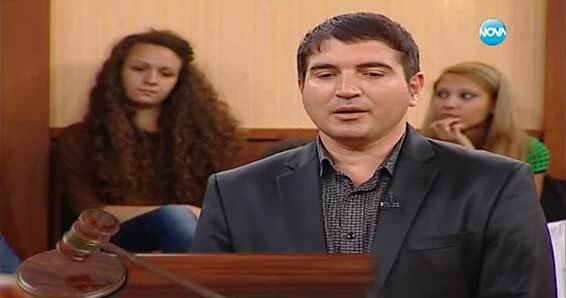 The TV show "Court Dispute" dated 23.09.2012 - episode 86, with the impressive name: "They adopted my child" was a very interesting case with Mr Vasilev’s participation, according to comments of friends and acquaintances. The episode examined the complex relationship between a parent and a child in its moral, ethical, and legal aspects, viewed through the relevant legislation that applies to the current case and its peculiarities. The case proved to be a delicate and difficult one for the mother who had not taken adequate care for the child and could not have provided an appropriate environment in which it could be nurtured and it could grow. However, our lawyer was morally satisfied that after the TV show he could still explain to her what rights she had and what she could do to preserve her relationship with her daughter and protect her rights as a mother in the future. We are consultancy and legal services provider, based in Bulgaria. We are the legal adviser of choice for in-house counsel, global businesses, public sector entities, entrepreneurs, start-up companies, national and international government departments and high net worth individuals. Our services range from representation in court for wide range of legal disputes, to setting up of comprehensive financial legal arrangements for multinational companies in order to optimize their business flow and minimize their administrative load and other financial cost. For the retail customers, we operate under the following brands in order to be able to provide the most appropriate services at competitive prices. All legal services are provided solely and exclusively by "H. Vasilev - Law Firm". The team of "Posolstvo.eu" is assisting foreign nationals to obtain residency, work permit, Bulgarian citizenship and relocate to Bulgaria, as well as those who are willing to attend university or are married to Bulgarian national. The experienced advisors are at the disposal of the customer to arrange all administrative procedures and legalizations in Bulgaria in order to obtain all required immigration documents and facilitate their move to the country and the EU as a whole. "Euroformat.eu" is providing advisory assistance to foreign investors and businesses to optimize their corporate structures and to register Bulgarian Company, setup foundation in Bulgaria or other business units, open bank account in Bulgaria, perform tax optimization and accountancy in Bulgaria. By optimizing their cash flow and tax load, the customers can achieve better financial results and at the same time be under the stable legal framework of the European Union regulations. 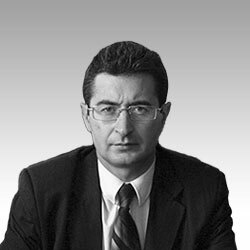 "H. Vasilev - Law Firm" is the law office of Mr Hristo Vasilev, our co-founding partner. He is providing legal services from the heart of Sofia to Bulgarian nationals and foreigners alike. 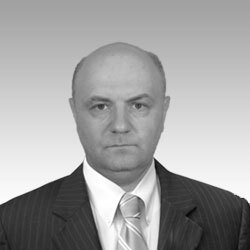 With huge experience as a licensed and registered lawyer in Bulgaria, Mr Vasilev is an invaluable member of our team who is assisting our customer with his deep and profound legal knowledge and experience. For more information, please visit Mr Vasilev's BLOG. Our offices in Bulgaria are conveniently located in the central and most prestigious areas of Sofia. The "James Bourchier" office is situated in the building of the Belgian Embassy with easy access to all major diplomatic missions and financial institutions. The "Rakovski" office is located in the heart of the old city centre within walking distance of the National Assembly of the Republic of Bulgaria, the office of the President of the Republic of Bulgaria, the Council of Ministers of the Republic of Bulgaria and all other important governmental bodies. If you want to contact our representative offices in Dubai or Hong Kong, please email to uae[at]bglaw.eu and hk[at]bglaw.eu respectively. Please do not hesitate to contact us for any questions and queries you might have. We look forward to provide you with invaluable services and assist you with your business in Bulgaria and abroad. All your enquiries will be treated with full confidentiality. We aim at responding to all enquiries within 24 hours. For urgent matters, please telephone us at your earliest convenience so we can assist you without delay.